While smartphones have made it easier to stay connected to friends, family, and work at all times, help with a car accident, their ubiquitous use poses a threat to our safety when used behind the wheel. When drivers choose to text, check email, surf the web, or use mobile apps when driving, devastating accidents often result. Although most people are aware that texting and driving is dangerous, it doesn’t stop drivers in passenger vehicles and commercial trucks from doing it every day. Each year, almost 390,000 people are hurt in accidents caused by texting and driving. In addition to serious injury accidents, fatal collisions have been occurring at an increasing rate as well. According to statistics released by DMV.org, 26% of all car crashes in one recent year involved the use of a cell phone. These accidents aren’t just minor fender benders either. Nine people die, and more than 1,000 are injured every day due to distracted drivers. Increasingly, the cause of that distraction is the cell phone. The worst culprits of texting while driving are teenagers. Remarkably, 42% of teens admitted to texting while they are behind the wheel. Texting and driving has surpassed drinking and driving as the leading cause of fatal car accidents for teens, according to Newsday. Because it is not always easy to establish that a driver was using a phone at the time of a crash, it is likely that these statistics vastly underrepresent the real number of drivers who were texting before a fatal collision. As the threat of fatal car accidents due to texting has increased, many states have taken action to crack down on the practice. Georgia is one such state. 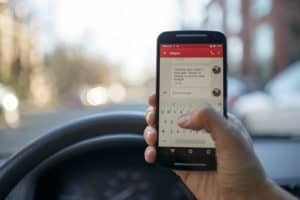 Georgia’s texting while driving laws make it illegal to write, read, or send a text while driving. This applies to any device that might be used to send texts, not just mobile phones. Additionally, state law prohibits holding your phone with any part of your body while driving. Even stricter laws are in place for truck drivers, who are not allowed to use any communication device that requires the pressing of more than one button. First offense: This results in a maximum fine of $50 and one demerit point. Second offense: If charged twice with cell phone use while driving, the penalties rise to a $100 fine and two demerit points. Third offense: A third offense will include up to $150 in fines and three demerit points. Offense by a commercial driver: A truck driver may face a fine of $2,750 for a distracted driver offense. Texting while driving is becoming a problem nationwide and here in Georgia. Accidents caused by distracted drivers will likely increase. The attorneys at Spiva Law Group represent people who have been hurt in distracted driving accidents in Savannah. If another driver put texting ahead of your safety and caused a crash, call us or contact us online to schedule a free consultation today.